Bevin & Brian's Totally Knitting Universe: Best Knitting Treats Ever! These are truly the most wonderful cupcakes ever! Click here for the full entry. She even includes a tutorial!! I am allergic to wheat so I can't have regular cupcakes. But give me a little flourless chocolate cupcake action and four hours to spend knitting individual cupcake toppings and I am all over it!! 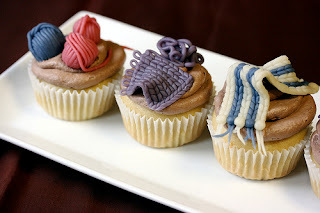 Maybe I really will make these cupcakes for our Wild Jersey City knitting group! do with and is having a giant sale out at her farm - details below. Feel free to pass it on to anyone you think might be interested. Listen, I know I just went on a yarn binge two weeks ago, but the turmoil in my life continues, so I am doing more yarn retail therapy. Plus, how often do you get an invite to a YARN YARD SALE??? With Koigu and not just a bunch of late 70s acrylic leftovers from someone's Nana's attic? I am picking Brian up at 9 AM Saturday. I certainly hope there is a sheep to go along with the barn. my sympathies re: your wheat allergy. have your triend babycakes on the lower east side! they have all kinds of wheat/GF goodies!